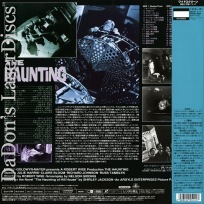 The Haunting 1963 - 112 min. - Black and White Genre: Horror LaserDisc Movie Storyline: A paranormal investigator invites a trio of people to help him examine Hill House, a sinister family estate haunted by the angry souls from its troubled past. While Eleanor (Julie Harris) looks for an escape from the memory of her recently-deceased mother, she becomes increasingly obsessed with the history of the huge, ominous house. Based on Shirley Jackson's lyrical novel, THE HAUNTING OF HILL HOUSE, and one of the most frightening psychological horror films ever made, featuring virtually no blood, gore, or monsters for its effective scares.